We are a leading Supplier & Manufacturer of Measuring Pins such as Carbide / Steel Measuring Pins and Carbide Pins from India. The manufacturing of this product involves using of quality raw materials and a number of advanced machines. The offered pins are used for the purpose of making several cutting tools. Manufactured as per IS Standards. Measuring pins are manufactured from high quality steel. Hardened, ground & lapped measuring pins are available in standard steps of 0.01, 0.02, 0.05, 0.10mm. Length of measuring pins up to 1.49 mm dia. is 40 mm & above1.50mm dia. it is 50mm. 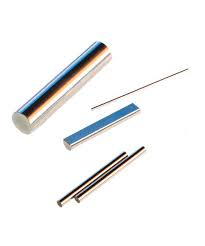 Measuring pins of 70mm in length are available from 1.00 to 10.00 mm dia. Loose pins or pins of odd sizes are available on request. 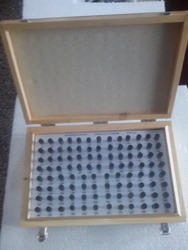 Pin set supplied in attractive wooden casing. Measuring Pins for checking of bores, centre distances, groove dimensions, inspection of micrometers, gear measurements etc. We offer a wide array of quality Measuring Pins. These measuring pins are designed to deliver an impeccable and durability. Accurate in design, these pins are offered in a two metal variants that is carbide and steel. We manufacture our pins in a large variety of sizes to suit the specific requirements of our clients. Hardened ground and lapped measuring pins with in standard steps of 0.01, 0.02, 0.05 & 010 mm. Diameter and length of pins varies in accordance. Pins of 1.49 mm diameter will have a length up to 40 mm and for pins with diameter 1.50 mm diameter, the length will be 50 mm. 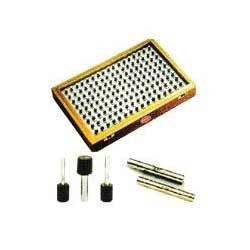 We are engaged in manufacturing and supplying a wide Range of Pin Gauges. These Gauges can be availed in both standard as well as customized designs and specifications as per the exact demands of clients. 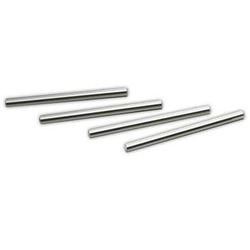 The Cylindrical Measuring Pins are made of superior quality high Carbon Chrome alloy steel, hardened to 58-60 HRC, to provide a high degree of wear resistance. The Measuring Pins are made of high accuracy and have a fine surface finish. 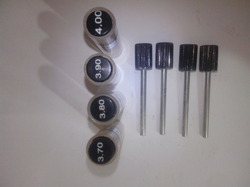 The Measuring Pins are for checking bores, tapers, distances, thread teeth, and for general gauging purposes. Different sizs of bores to be measured. Number of bores to be checked. Offers Carbide Pins from 0.5-10mm in ' Gr. 1' (Mfg. Tol +/- 0.001mm) & 'Gr. 2' (Mfg. Tol +/- 0.002mm) as per IS:11103 standard. * Supplied in set/ individual as per customer requirement.